Now in its 4th year HKIRSF is bringing some of the world’s finest full size bands, selecters and vibes to the heart of central for the biggest line up yet! Building on the success of last year’s sold out event we have continued to bring the uplifting and joyous Jamaican musical genre to the city. 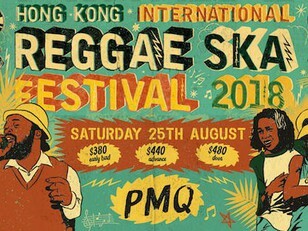 This year’s event will take place at PMQ on Saturday August 25th and will be the biggest event yet with a bigger line up and vibes than ever before in Hong Kong. This is the first appearance in the city for one of the most influential Ska bands of all time. They have release 9 studio albums, numerous singles, EPs, compilations and Coolie Ranx, Matt Malles, Brian Sledge and original Skatalite Lester Sterling. They have been hugely influential in the Third Wave Ska scene inspiring bands such as Mighty Mighty Bosstones, Less Than Jake and No Doubt. They have played many top festivals around the world and will be skanking for the first time since the '80s with original member and write Sean 'Cavo' Dinsmore on toasting duties at this year's HKIRSF. Oreskaband are one of Japan's most well know Ska outfits and feature a full band sound with an all female line up! Formed in 2003 after meeting in high school, they were signed by Sony records and have since released numerous albums and singles. They were the first Japanese band to perform all 43 dates on the Vans US Warped Tour in 2008 as well as sold out shows across Europe and Fuji Rock Festival. 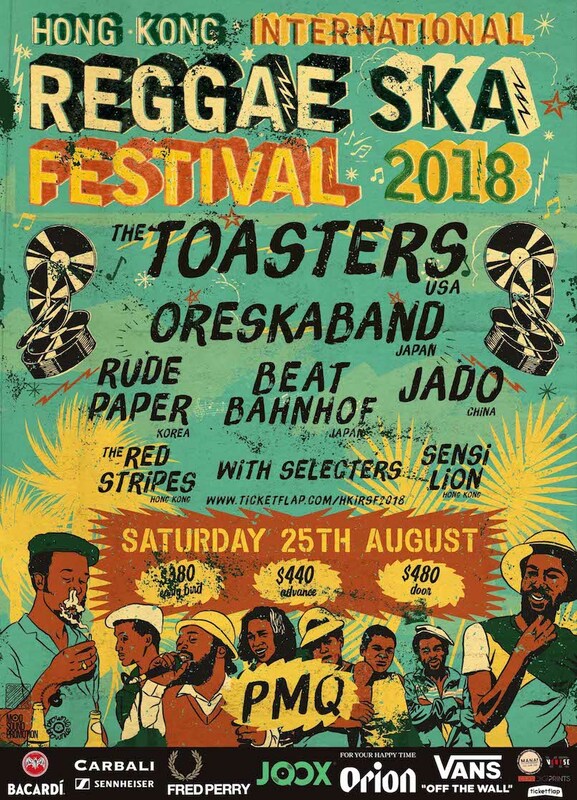 This will be the first time they have performed in the city bringing high energy skanking to the HKIRSF stage, grab your tickets soon for the biggest festival of Reggae Ska in the heart of the city! Signed to Sony previously Rude Paper's Reggae vibes featuring Mcs Koonta, Real Dreamer and guitarist Kevon have seen them rise to the top of the Asia Reggae scene. They have released numerous singles and albums with their latest drop the brilliantly critically acclaimed 'Destroy Babylon' recorded at Bob Marley's legendary studio Tuff Gong Studios in Kingston, Jamaica. They are bringing a full band with them to this year's HKIRSF in their first performance in the city. Shanghai Reggae pioneer Jado returns to Hong Kong after his explosive Sonar 2017 appearance. Known for his intense performances since 2010, he has risen to the top of the Chinese Reggae and Jungle scene as part of duo Far East Lion. Recent releases 'Fire' and 'Real Lilfe' have gone viral on mainstream Chinese music platforms and he continues to bring Ragge vibes to Chinese audiences. Catch his performance with local legend Blood Dunza (Heavy Hong Kong) bringing the vibes to the stage at HKIRSF this year! The brilliant Beat Bahnhof return to HKIRSF by popular demand for an early set after their skanking show in 2016. Previously supporting Tokyo Ska Paradise Orchestra on dates around Japan and gracing the stage at the world's foremost Ska festival the London Ska Festival they will be bringing full band sounds to this year's stage, get a ticket and get down early for the best vibes in the city this summer! The Red stripes return to HKIRSF with their first full set and full line up since HKIRSF 2015! Recently released album 'In The Ska East' was in the top 10 Ska albums of 2017 by legendary Do The Dog Music, performed last year on the main stage at Clockenflap and recently toured Osaka and Seoul. They continue to put Hong Kong Ska on the world map and will be skanking with a full set of originals and reinterpretations at this year's HKIRSF! The brilliant Cantonese Reggae band return to open this year's festival with a cool new set of instrumental vibes and Dub interpretations. After playing at many of the cities top events and festivals they will bring great vibes to get the skankin' started.